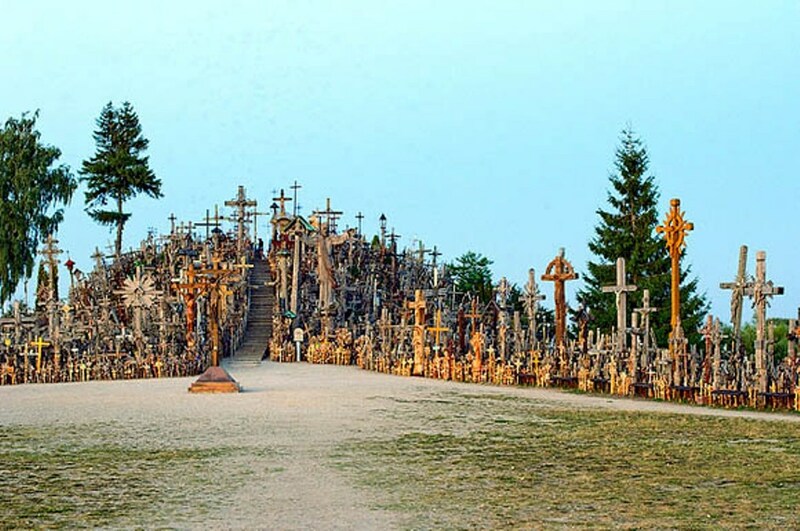 The Hill of crosses is a pilgrimage site located 12km north of the small Siauliai city in northern Lithuania. On the Hill at present there are over 200,000 crosses that are a sign of Christian devotion and memorial to Lituanian national identity. The crosses are so many that it is difficult to count them. The crosses are of different sizes and made of different materials. Some are made of metal, some of wood or granite and are piled on top of each other. How and when the practice of leaving the crosses on the hill started is a mystery. Before the 1800s, there was a Domantai fort in that area and it is said that probably the first cross was placed after the Uprising of 1831 as a symbol of Lithunian defiance of foreign invaders. Over the century’s giant crucifixes, statues of Virgin Mary, carvngs of Lithuanian patriots and thousands of tiny effigies and rosaries have been placed here. In 1795 Siauliai was incorporated in Russia and returned to Lithuania in 1918. After the peasant uprising of 1831-1863 many crosses were erected on the hill. Relatives of the dead rebels who had no bodies to bry left crosses on the hill in memory of their lost loved ones. There were around 150 crosses by the end of 1895. In 1914 around 200 and by 1940 there were around 400 crosses. Throughout this time the hill was a place for the Lithuanians to pray for their country and their loved ones who had sacrificed themselves in the wars of independence. In the years of 1963, 1971 and 1975 the Soviets leveled the hill by removing all the crosses and burning them. But each time pilgrims from all over Lithuania replaced the crosses. Finally in 1991, when Lithuania became independent the Hill of Crosses became her national identity and a symbol of her catholic faith. There is another legend behind the Hill of Crosses. The story is of a Lithuanian farmer whose daughter was sick and was going to die. She was treated by all the doctors and given all possible medicines, but her health kept on deteriorating. Every night the farmer sat besides his daughter and kept praying for her health. One night while besides his daughter the farmer had a dream. A woman dressed in white clothes asked him to follow her instructions to make his daughter better. According to her instructions, the farmer built a large wooden cross and placed it on the hill of the Domantai Fort. The woman in white said that the cross was a sign of faith and love for God and it would heal his daughter. After he had placed the cross his daughter was cured of her illness and amazingly before he returned home she was out of her bed waiting for him. The story of the cross and the miracle hill spread all over Lithuania. People came and placed a cross on the hill in hopes of curing their loved ones who were sick. Every year thousands of pilgrims visit the Hill. The number of crosses is growing every year.